A major retrospective of legendary British photographer Don McCullin opens today in London. The Tate Britain exhibition will show over 250 photographs taken over a 60 year career – and which have all been printed by McCullin himself in his home darkroom. 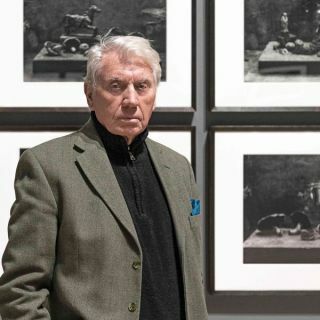 Sir Don McCullin is best known as a war photographer – and has captured images of conflict from around the world including Vietnam, Northern Ireland, Lebanon and Biafra. His early images were often taken at great personal risk (his Nikon once saved his life, taking the bullet that was aimed at him in Cambodia). Alongside his iconic documentary work, the exhibition will show his travel assignments and his long-term passion with landscape and still life which he has turned his camera to more frequently in the last 30 years. Now aged 83, McCullin began taking photographs in the 1950s, documenting his surroundings and local community in his native Finsbury Park, London. In 1958 his photograph The Guvnors, a portrait of a notorious local gang, was published in The Observer, launching his career as a photojournalist. Working first for The Observer and then The Sunday Times Magazine, McCullin went on to capture major conflicts around the world from Vietnam and the Congo to Cyprus and Beirut. The exhibition includes some of McCullin’s most iconic photographs including Shell-shocked US Marine, The Battle of Hue 1968, Starving Twenty Four Year Old Mother with Child, Biafra 1968 and Northern Ireland, The Bogside, Londonderry 1971. Alongside McCullin’s hand-printed silver gelatin prints, the exhibition also includes the photographer’s magazine spreads, contact sheets, his helmet, and that very Nikon camera which took a bullet for him in 1970. The exhibition runs until 6 May at Tate Britain, and is open from 10am to 6pm every day.